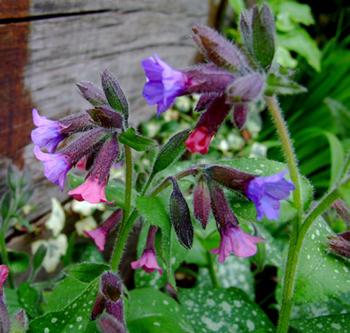 Lungwort is a perennial plant; the horizontal, creeping rootstock produces several bristly stems with alternate ovate, dark green leaves which are petioled at the bottom of the plant and become sessile near the top. The funnel-shaped flowers grow in terminal clusters from March to May. They turn from rose-colored to blue, both colors being found on the plant at the same time. Other varieties: Bethlehem sage (P. saccarata) has white-spotted leaves and white to reddish violet flowers; the variety ‘Roy Davidson’ has gray-blue leaves with silvery splotches, flowers turn from clear blue to light pink; P. angustifolia has dark blue flowers; and P. montana has violet flowers and bright green leaves. Grows in shady areas, moist soil, cool to moderate temperatures; in Europe and in the northern parts of the United States; cultivated in gardens also. In the Middle Ages it was commonly believed that the outward appearance of a plant was a God-given sign of the medicinal value contained within. Under this concept, called the Doctrine of Signatures, lungwort received its name: its lung-shaped leaves were considered a sign of its ability to treat lung diseases. Based on folklore, this doctrine was formally stated by the 16th century physician Philippus Aureolus Theophrastus Bombastus Paracelsus von Hohenheim. Interestingly, Native Americans had the same idea in their herb lore, even before they were exposed to white men. The problem with the concept is that, although it works well for some plants, it generally takes a great deal of creative imagination to match the outward appearance of most plants to the “appropriate” medicinal use. The tea is used for diarrhea, hemorrhoids, respiratory problems, coughs, asthma, flu, colds, the grippe, catarrh, and hoarseness. It has mildly diuretic properties. The decoction may be helpful for bleeding lung problems. 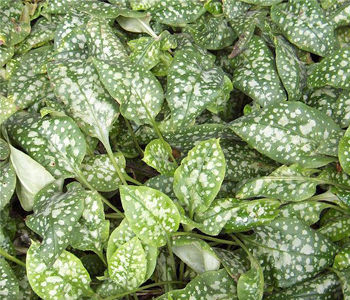 Externally, the plant is used for all kinds of wounds, ulcers, and sores. Decreases the menstrual flow when excessive. Poultice helps enlarged thyroid, burns, tumors, and reduces swelling and inflammation from injuries and bruises. Infusion: steep 1 tbsp. herb in 1 cup hot water. Take 1 cup per day. Decoction: use the same quantities, but boil for a few minutes. Take 1 cup per day. Juice: take 1 tsp., 3 times a day, with honey. Powder: take 1 tsp., 3 times a day, with milk. If a cough persists for more than 2 weeks, do not try to treat it. See a medical professional immediately.